Rockstar Games have returned from its unexpected new content hiatus to release their first “Next-Gen” video game, Red Dead Redemption 2. A prequel to the highly acclaimed and successful 2010 game, Red Dead Redemption, its sequel takes everything players loved about the first game and brings it up to a whole new level entirely. From the games’ story, to its immersive and vast open world setting, Red Dead Redemption 2 has once again showed us that the developers behind Rockstar Games are masters at their craft. Screenshot By Jacob Ybarra (Playstation 4). 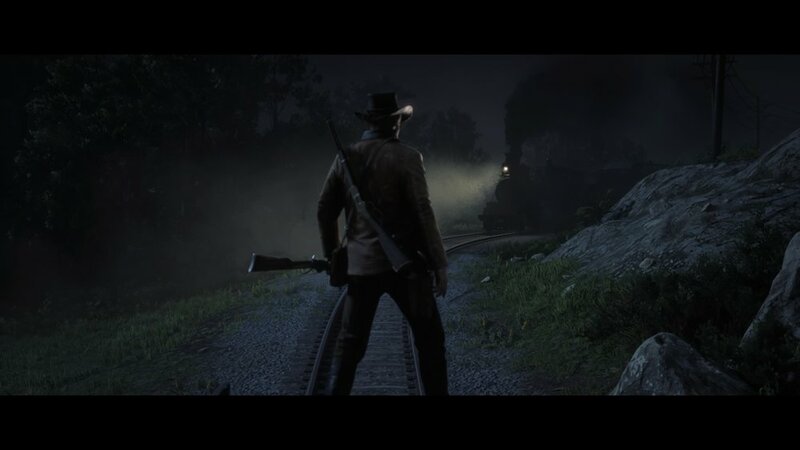 The protagonist Arthur Morgan, entering the quaint town of Valentine. The game follows Arthur Morgan and the Van der Linde gang, as they flee from the law and attempt to survive as outlaws in the dying West. And while the main story of the game is just as engaging and entertaining as you’d expect a Rockstar game to be with near perfect character development and engaging storylines. But where Red Dead Redemption 2 truly shines is with its engaging and massive open world. Under the cover of night, you block the tracks as a train approaches, preparing for an armed robbery. To start, the world itself is massive. Being the largest open world created by Rockstar to date says a lot, as their last release, Grand Theft Auto V, was impressively big upon release as well. But the key innovation brought to the world of Red Dead Redemption 2 is how it interacts with the player. The vast American frontier isn’t just a playground for players to explore, but instead it is a living breathing world, full of both rewards and consequences. The vast and open plains of the American West. For what I’d argue to be the first time in gaming history, a developer has created a world that has real stakes and is highly reactive to how the player chooses to play the game. While roaming the trails, you are just as cautious to rob a travel in fear of getting recognized at a later time in town, as you are intrigued to assist a stranded individual in hopes of being rewarded upon your next meeting. From large towns to small farm houses, every aspect of the open world is alive and full of interesting and unique characters. Regardless of how you play, the game’s honor system is fluid and flexible. You can choose to be an honorable man, or a ruthless outlaw, and the environment reacts accordingly around you. Red Dead Redemption 2 offers players a true lifelike experience when it comes to open world gaming. It goes above and beyond in terms of delivering an authentic and engaging experience to the player, and shows that the developers behind Rockstar Games are still masters of their craft.